Confidence. There are a couple of examples of confidence in this game which I took note. First, Bradford looked like he had a lot more confidence in his receivers than last year. There were a lot of throws to open receivers but there were also a number of throws to covered receivers. Rarely, last year, did Bradford feel confident enough in the receivers to throw the ball even when the receivers were covered. This resulted in a lot of check downs. Last night, as the night went on, Bradford seemed more and more confident in throwing to covered receivers (such as one of Diggs’ TDs). This could have been just due to Bradford’s general growing confidence in the game or it might be the product of the off season work. It will be something that I will be watching going forward. The second example of confidence was the fact the Vikes ran a pitch play to Dalvin Cook with less than 2 minutes to go. Obviously, there is more of a risk in a pitch play than a straight handoff — I thought it showed great confidence in Cook. Also, do you realize the three rookies are in the top 5 of rushing the first week? That is pretty remarkable in itself. Peterson. 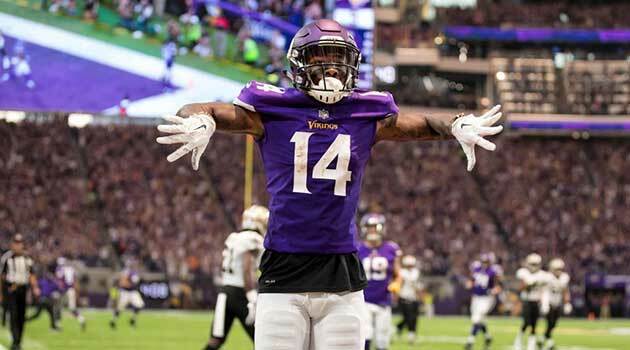 Did anyone get the feeling that Sean Payton wanted to get AD a touchdown in the Vike’s house? I don’t think AD will finish the season with the Saints. Barr/Kendrick. I was surprised to see Barr had more tackles and TFL (8; 1.5) than Kendricks (6; 0). I thought Barr played well but Kendricks seemed to be everywhere. Regardless, Linval presents the canvas upon which the backers paint their artistry. Elflein. I have memorize how to spell his name because I feel I may be writing about him often. It is not often that a Olineman catches my eye but Elflein seems very athletic and able to get to the second level. He may follow a long line of athletic Viking centers. Thielen/Diggs. One word to describe each. Thielen — inspirational. Diggs — dynamic. Quick questions in my mind. Jaleel Johnson inactive? Treadwell, being brought along slowly or not ready for prime time? Another missed extra point? One Coaching Criticism. I know I shouldn’t complain about anything but this stuck out in an otherwise near perfect game. In the 4th quarter, Thielen was marked just short of a first down when he went out of bounds. Time stopped. Zim should have challenged the spot. Vikings had 3 time outs. Burning a challenge at that point only had upside. The only think I could think of was that Zim didn’t want to freeze his own kicker. Small criticism but I felt I had to find something.